This is the 128th edition of the Walter Camp All-America team – the nation’s oldest All-America team. Twenty-six players have been selected to the first team by the 130 Football Bowl Subdivision head coaches and sports information directors. In addition, 26 players were selected to the Second Team. From 1889 to 1964, eleven players were selected. In 1965, both offensive and defensive teams were picked. In 1972, the first punter (Ray Guy, Southern Mississippi) was honored. In 1975, the first placekicker (Chris Bahr, Penn State) was selected. In 1998, the first-ever Second Team All-America team was recognized. In 2001, the first kick returner (Herb Haygood, Michigan State) was picked. In all, 33 different schools from nine conferences (including independents) were represented on the All-America First and Second Teams (a total of 52 players selected). Oklahoma had four players selected to the First Team, while Auburn had three honorees (1 First Team and 2 Second Team). Wisconsin had four Second Team All-America honorees, while top-ranked Clemson had three. Overall, the Atlantic Coast Conference had the most honorees (11), followed by the Big Ten (10) and Big 12 (9). Nineteen different schools are represented on the 2017 Walter Camp All-America First Team. Of the 19 schools, Penn State has the most storied tradition of placing members on the team. The Nittany Lions had their first selection in 1906, center/linebacker W.T. Dunn. This year, Penn State is represented on the First Team by junior running back Saquon Barkley. Barkley is the first PSU running back to earn Walter Camp All-America honors since Larry Johnson (2002). Since 1906, Penn State has had 53 Walter Camp First Team All-Americans. Of the 26 First Team selections, 13 are seniors. There are 10 juniors and three sophomores. On the Second Team (26 total selections), there are 10 seniors, 10 juniors, five sophomores and one freshman (Jonathan Taylor, RB, Wisconsin). 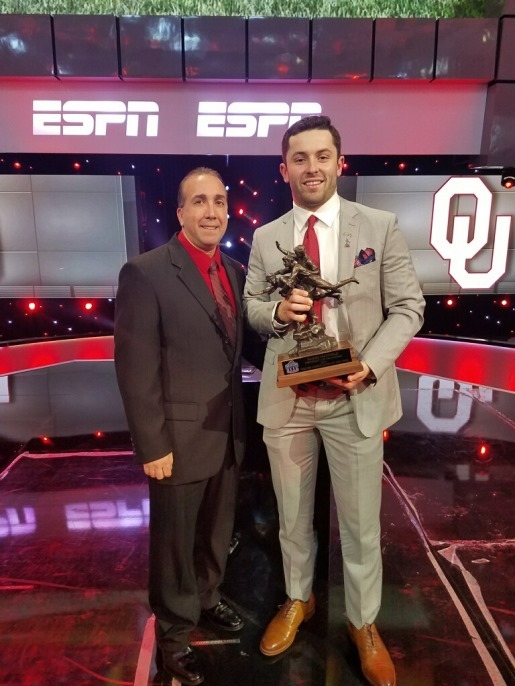 The 51st recipient of the Walter Camp Player of the Year award, Baker Mayfield is the fourth Oklahoma player to win the prestigious honor, joining former Sooner quarterback Josh Heupel (2000) and running backs Billy Sims (1978) and Steve Owens (1969). Overall, Mayfield is the 19th quarterback to earn the award. Mayfield is also eighth player from a current Big 12 Conference school to win the award, and the first since 2009 (Colt McCoy, Texas). The 2017 Big 12 Offensive Player of the Year, Mayfield leads the nation in passing efficiency (203.8), while ranking second in passing yards (4,340) and passing touchdowns (41). Mayfield has completed 71 percent of his passes (262-of-369) and has thrown just five interceptions in 13 games. One player – offensive lineman Cody O’Connell (Washington State) – is a repeat First Team All-American. First Team quarterback Baker Mayfield was a First Team selection in 2015. First Team offensive center Billy Price (Ohio State) and defensive back Minkah Fitzpatrick (Alabama) were Second Team honorees a year ago. First Team placekicker Daniel Carlson (Auburn) was a Second Team selection the last two seasons. Second Team defensive lineman Christian Wilkins (Clemson) is a repeat Second Team pick. Second Team quarterback Lamar Jackson (Louisville) and punter Mitch Wishnowsky (Utah) were both First Team selections in 2016. Alabama has had at least one Walter Camp First Team All-American in each of the last seven years. It is the longest current streak. The all-time record belongs to Notre Dame (18 straight years, 1964 to 1981). Billy Price is the third straight Ohio State center (Taylor Decker, 2015; Pat Elfein, 2016) to earn Walter Camp First Team All-America honors. Oklahoma has four First Team All-America honorees. The record for the most first team All-Americans is five, also held by Oklahoma in 2003. Two members of the Notre Dame offensive line – guard Quentin Nelson and tackle Mike McGlinchey – are First Team All-Americans. It is first time since 2012 (Alabama) and sixth time overall that two offensive lineman from the same school have been honored as First Team All-Americans. Defensive back Jalen Davis is the first Utah State First Team All-American since 1969 (defensive lineman Phil Olsen). Sutton Smith is the second Northern Illinois player (running back LeShon Johnson, 1993) to earn Walter Camp First Team All-America honors. Ed Oliver is the first Houston player since Andre Ware (1989) to be selected a Walter Camp First Team All-American. Each week during the regular-season, the Walter Camp Foundation recognizes a National FBS Offensive and Defensive Player of the Week. In all, players from eight different conferences were recognized with the Big Ten Conference having the most honorees with seven, followed by the Atlantic Coast Conference with five. Eight First and Second Team All-American members were recognized during the 2017 regular season, led by Second Team running back Rashaad Penny (San Diego State), who was recognized twice (Sept. 9 and Nov. 19). In addition, First Team quarterback Baker Mayfield (Nov. 5) and running back Bryce Love (Sept. 30) were reconigzed. On the defensive side, First Team linebacker Josey Jewell (Iowa) was honored on Sept. 2, and his teammate, First Team defensive back Joshua Jackson was recognized on Nov. 5. Second Team linebackers Micah Kiser (Virginia, Sept. 16) and T.J. Edwards (Wisconsin, Nov. 19) were also honored as was Second Team defensive end Austin Bryant (Clemson, Sept. 9). The 2017 Walter Camp All-America team along with major award winners (Alumni Award-Eddie George; Man of the Year-Calvin Johnson; Distinguished American-Lee Corso) will be honored at the organization’s 51st annual national awards banquet, presented by David McDermott Lexus of New Haven, on Saturday, January 13, 2018 at the Yale University’s Lanman Center in New Haven, CT.